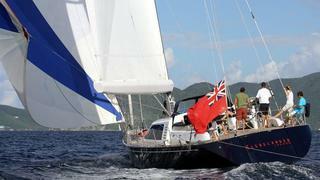 Tim Quinlan at Nautor's Swan UK calls to say he's signed the 24.89m Swan 82 sailing yacht Clevelander for sale. Built by the Nautor yard in 2004 to Bureau Veritas class, she's had several upgrades since and Tim says that, having inspected her last month, she's in excellent condition and well worth a viewing. Fully MCA coded, she could make an excellent charter yacht. Her current layout accommodates six guests in a master suite plus a double and twin cabin. Clevelander currently has a sauna fitted in lieu of another cabin but the owner's looking to change that this winter to give the option of four staterooms. Lying in Slovenia, Clevelander is asking $4.75 million.